Objectives The mucin MUC1, best known for providing an epithelial barrier, is an important protective host factor in both humans and mice during Helicobacter pylori pathogenesis. This study aimed to identify the long-term consequences of MUC1 deficiency on H. pylori pathogenesis and the mechanism by which MUC1 protects against H. pylori gastritis. Design Wildtype and Muc1−/− mice were infected for up to 9 months, and the gastric pathology, immunological response and epigenetic changes assessed. The effects of MUC1 on the inflammasome, a potent inflammatory pathway, were examined in macrophages and H. pylori-infected mice deficient in both MUC1 and inflammasome components. Results Muc1−/− mice began to die 6 months after challenge, indicating Muc1 deficiency made H. pylori a lethal infection. Surprisingly, chimaeric mouse infections revealed MUC1 expression by haematopoietic-derived immune cells limits H. pylori-induced gastritis. Gastritis in infected Muc1−/− mice was associated with elevated interleukin (IL)-1β and epigenetic changes in their gastric mucosa similar to those in transgenic mice overexpressing gastric IL-1β, implicating MUC1 regulation of an inflammasome. In support of this, infected Muc1−/−Casp1−/− mice did not develop severe gastritis. Further, MUC1 regulated Nlrp3 expression via an nuclear factor (NF)-κB-dependent pathway and reduced NF-κB pathway activation via inhibition of IRAK4 phosphorylation. The importance of this regulation was proven using Muc1−/−Nlrp3−/− mice, which did not develop severe gastritis. Conclusions MUC1 is an important, previously unidentified negative regulator of the NLRP3 inflammasome. H. pylori activation of the NLRP3 inflammasome is normally tightly regulated by MUC1, and loss of this critical regulation results in the development of severe pathology. MUC1 polymorphisms are associated with gastric carcinogenesis in humans and MUC1 protects against Helicobacter pylori gastritis in mice. MUC1 acts as a releasable decoy molecule to restrict bacterial adhesion to epithelial cells, thus preventing colonisation by H. pylori. Polymorphisms in the interleukin-1β gene are also strongly associated with gastric carcinogenesis. 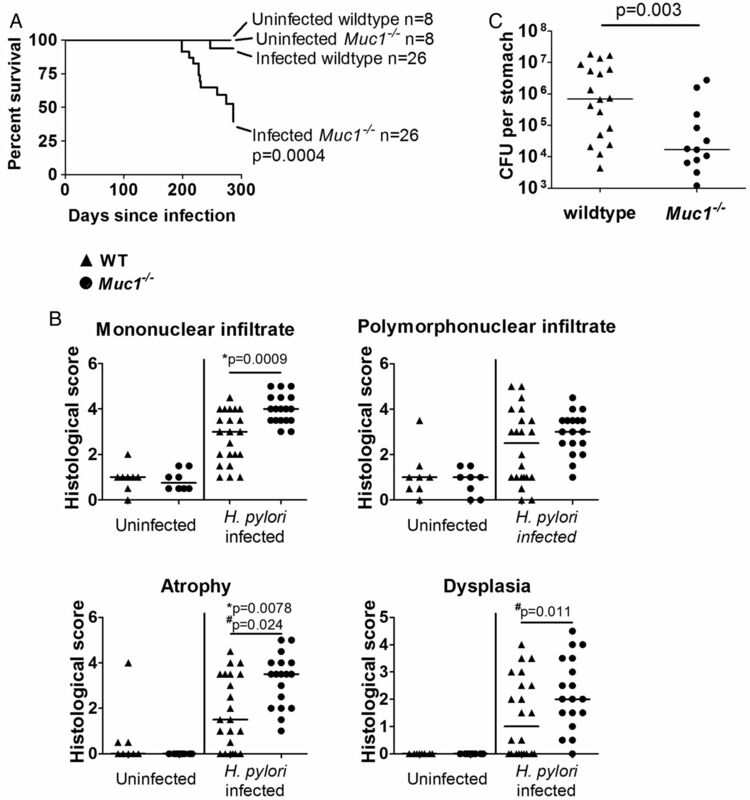 Experimental evidence that MUC1 is critical for surviving H. pylori infection. MUC1 expression on immune cells, and not solely epithelial cells, limits gastritis during H. pylori infection. MUC1 regulates nuclear factor-κB pathway activation to negatively regulate the NLRP3 inflammasome. Regulation of NLRP3 inflammasome activity (by MUC1) is critical for the prevention of severe gastritis. Dysregulation of the NLRP3 inflammasome may contribute to gastric carcinogenesis in certain individuals. Targeting the NLRP3 inflammasome may provide a potential approach for controlling gastric carcinogenesis. A major constituent of the GI surface are mucins, carbohydrate-rich glycoproteins that can be secreted or cell-surface associated, and which are best recognised for their protective role in mucosal barrier function. MUC1 is a cell-surface-associated mucin, highly expressed on mucosal epithelial cells (and predominant on gastric epithelial cells), which provides an effective physical barrier against pathogens.1 ,2 Less well appreciated is that MUC1 is also expressed by immune cells, including B cells, T cells, monocytes, macrophages and dendritic cells.3–6 The potential role of MUC1 on these cells during mucosal infections is poorly understood. Human polymorphisms in MUC1 are similarly associated with susceptibility to Helicobacter-associated gastritis and gastric adenocarcinoma, demonstrating a key role for MUC1 in regulating H. pylori-related pathogenesis.11–13 In mice, we have shown that MUC1 is a potent regulator of both H. pylori colonisation and associated pathogenesis, with Muc1−/− mice developing an increased severity of Helicobacter-induced atrophic gastritis.14 We identified that epithelial Muc1 regulates H. pylori colonisation by acting as a releasable decoy molecule that limits bacterial adhesion.15 However, we now demonstrate that surprisingly it is MUC1-expressing leucocytes that suppress H. pylori-induced gastritis, and that MUC1 mediates this protective effect by acting as a previously unrecognised negative regulator of the NLRP3 inflammasome. Specific pathogen-free Muc1+/+ and Muc1−/− 129/Sv mice (kindly provided by Sandra Gendler)16 were bred and housed in the Parkville Veterinary Science animal house, University of Melbourne. F3 Muc1−/−Casp1−/−, Muc1−/−Nlrp3−/− and matched controls were generated by intercrossing Muc1−/− mice with Casp1−/− (Casp11-deficient)17 or Nlrp3−/− C57BL/6 mice. For radiation chimeras, recipient mice were lethally irradiated with two doses of 550 rad 3 h apart using a 60Co source (Walter and Eliza Hall Institute of Medical Research), then, the next day, transplanted intravenously with 2×106 bone marrow cells harvested from the femurs and tibias of donor mice. Mice were maintained on drinking water containing 2 mg/mL neomycin (Gibco) for 2 weeks. Mice were left for 2 months prior to infection to allow reconstitution. H. pylori SS118 was cultivated as described previously.14 Mice were infected with a single orogastric dose of 107 H. pylori (estimated by light microscopy) suspended in 100 μL brain heart infusion broth (BHI). Longitudinally halved stomachs were fixed in 10% neutral buffered formalin, embedded in paraffin and 5 μm sections stained with H&E. Infections were assessed histologically for infiltrating inflammatory immune cells, atrophy and dysplasia as previously described.19 ,20 For quantitatively assessing (gland) atrophy, five full glands were randomly selected from each of two images of corpus mucosa from blinded H&E or Alcian blue/periodic acid–schiff (PAS)-stained sections. Using ImageJ, parietal cells were point counted. Longitudinally halved stomachs were homogenised (T10 homogeniser, IKA-Werke) in BHI and colony-forming assay performed as described previously.14 Culture supernatants and organ homogenates (homogenised in phosphate buffered saline (PBS) or after colony-forming assay) were centrifuged to remove debris prior to quantification of cytokine by ELISA as previously described.21 Primary antibodies: antimouse tumour necrosis factor (TNF)-α (0.1 μg/well; BioLegend), macrophage inflammatory protein (MIP)-2 (0.1 μg/well; R&D Systems), interferon (IFN)-γ (0.1 μg/well; BD Biosciences), IL-17A (0.5 μg/well; eBioscience), IL-6 (0.05 μg/well; eBioscience), IL-1β (0.2 μg/well; R&D Systems), IL-10 (0.1 μg/well; BD Biosciences), transforming growth factor (TGF)-β (0.1 μg/well; BD Biosciences) or IL-18 (0.1 μg/well; R&D Systems). Secondary antibodies: biotinylated antimouse TNF-α (0.025 μg/well), MIP-2 (3.7 ng/well), IFN-γ (0.05 μg/well), IL-17A (0.025 μg/well), IL-6 (0.025 μg/well), IL-1β (0.03 μg/well), IL-10 (0.05 μg/well), TGF-β (0.05 μg/well) or IL-18 (1/2000; same manufacturers as capture antibody). Sample concentration was determined against a standard curve of recombinant cytokine (same manufacturers as antibodies). Tff2 methylation levels were quantitated as described previously.22 Briefly, genomic DNA (gDNA) was isolated from mouse stomach tissue using the DNeasy tissue kit (Qiagen) or using TriZOL (Invitrogen) and 500 ng was bisulfite-converted using Zymo EZ DNA methylation reagents (Zymo Research). Mouse Tff2 fragments were recovered from bisulfite-converted gDNA by nested PCR. Quantitative methylation analysis of bisulfite PCR-amplified products was performed with the EPITYPER system (Sequenom) using MassCLEAVE reagents followed by matrix-assisted laser desorption ionisation time of flight mass spectrometry. Data cleaning and two-way hierarchical cluster analysis of methylation output values were performed using the R script and gplots software. Non-induced peritoneal macrophages were isolated by flushing the peritoneal cavity with 10 mL of ice-cold PBS containing 2% (v/v) fetal calf serum (FCS) (HyClone) and bone marrow-derived dendritic cells were cultured as described previously.21 Cells were stimulated with Escherichia coli lipopolysaccharide (LPS) (100 ng/mL, Sigma), live H. pylori (multiplicity of infection 10) or H. pylori sonicate lysate (5 μg/mL protein by BCA (Pierce)). To inhibit IKK activation, 12 μM BAY 11-7082 (Sigma) was added to cells for 45 min before stimulation. IRAK1/4 was inhibited by adding 1 μM IRAK1/4 Inhibitor I (Sigma) 30 min before stimulation. Stimulations were performed on 106 cells/mL in Roswell Park Memorial Institute medium 1640 with 10% FCS, penicillin and streptomycin (Gibco). RNA was extracted using Tri Reagent (Ambion), then converted to cDNA using the Quantitect Reverse Transcription Kit (Qiagen). For long-term infected mice, RNA was extracted from paraffin-embedded stomachs using the RNeasy FFPE Kit (Qiagen). For qPCR, duplicate reactions of 25 μL containing 12.5 μL QuantiTect SYBR Green PCR Master Mix (Qiagen), 0.2 μM primers and 3 μL of cDNA (diluted to 150 µL) were performed in an Mx3000P cycler (Stratagene). Primer efficiencies were calculated with LinRegPCR,26 and relative expression calculated relative to Actb. Primers: Actb—F, 5′-CGTGAAAAGATGACCCAGATCA-3′, R, 5′-CACAGCCTGGATGGCTACGT-3′; Nlrp3—F, 5′-ATGGTATGCCAGGAGGACAG-3′, R, 5′-ATGCTCCTTGACCAGTTGGA-3′; Tff2—F, 5′-CCCCACAACAGAAAGAAC-3′, R, 5′-GGGCACTTCAAAGATCAG-3′. Cell lysates were collected in radioimmunoprecipitation buffer (150 mmol/L NaCl, 1% IGEPAL, 0.5% deoxycholic acid, 0.1% sodium dodecyl sulfate (SDS), 50 mmol/L Tris, pH 7.5) containing protease inhibitor cocktail (Complete, mini, EDTA-free; Roche). Samples were separated on 8% SDS-PAGE gels then transferred to nitrocellulose membranes (Amersham Biosciences). Membranes were blocked with 5% skim milk and probed with anti-NLRP3 antibody (Cryo-2; Adipogen), anti-phospho-p65, anti-total p65, anti-phospho-IKKα/β, anti-IKKβ, anti-phospho-IRAK4, anti-total IRAK4 or anti-β-actin (all from Cell Signaling). Bound primary antibodies were detected with horseradish peroxidase-conjugated antirabbit (Dako). Labelled proteins were visualised by incubating the membrane in ECL Prime reagent (Amersham Biosciences) and using an ImageQuant LAS 4000 (GE Healthcare). Sodium fluoride was added to radioimmunoprecipitation buffer and skim milk at 20 mM or to other buffers at 2 mM when assessing phosphorylation. Densitometry was performed using ImageJ. Survival was assessed using the Mantel–Cox test. Non-parametric histological gradings were analysed using Mann–Whitney U tests to assess relative severity and Fisher's exact test to assess absence or presence of criteria. All other data were analysed using one-way analysis of variance with Dunnett's post hoc test. 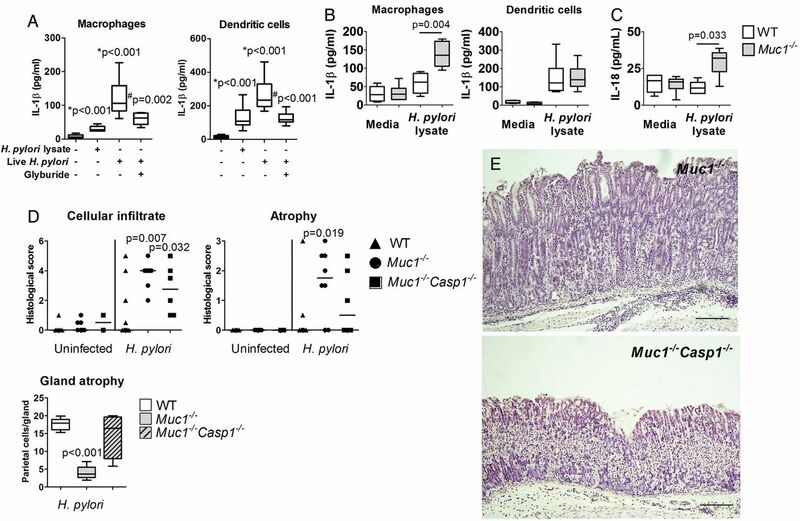 MUC1 protects against gastric dysplasia and death during chronic Helicobacter pylori infection in mice. Wildtype (WT) and Muc1−/− mice were infected with H. pylori SS1 (n=8 uninfected and n=26 infected each). (A) Kaplan–Meier survival curve, considering mice that required euthanasia on ethical grounds as events and mice that did not exhibit clinical signs as censored. H. pylori infection was a significant cause of death in Muc1−/− mice (Mantel–Cox). (B) Blinded H&E-stained gastric sections from WT and Muc1−/− mice that were left uninfected or infected for ≥8 months were assessed for inflammation. Graphs present individual mice (points) and group medians (horizontal bar). H. pylori-infected Muc1−/− mice developed significantly more severe mononuclear cellular infiltrate and atrophy (*Mann–Whitney) and a significantly higher proportion developed atrophy and dysplasia (#Fisher's exact test) compared with infected WT mice. (C) A colony-forming assay was performed on half stomachs from WT and Muc1−/− mice that had been infected for ≥8 months. Muc1−/− mice had significantly reduced colony-forming units compared with WT mice (analysis of variance). Representative gastric histopathology from mice with chronic Helicobacter pylori infection. (A) Uninfected, average and severe pathology observed in infected Muc1−/− mice. (B) Average pathology observed in infected wildtype (WT) mice is shown. 100 μM scale bars. Solid line indicates cystic dysplasia, shown in higher magnification in (C); dashed and dotted lines indicate ‘nuclear’ dysplasia, shown in higher magnification in (D) (20 μM scale bars). To characterise the accentuated H. pylori-induced gastritis observed in MUC1 deficiency, we assessed key cytokines in the gastric tissues of mice infected for 1, 2 or 8 months. No difference was observed in proinflammatory TNF-α, IL-6, MIP-2, IFN-γ or IL-17A in stomachs from uninfected and H. pylori-infected wildtype and Muc1−/− mice at any time point (figure 3A–E). 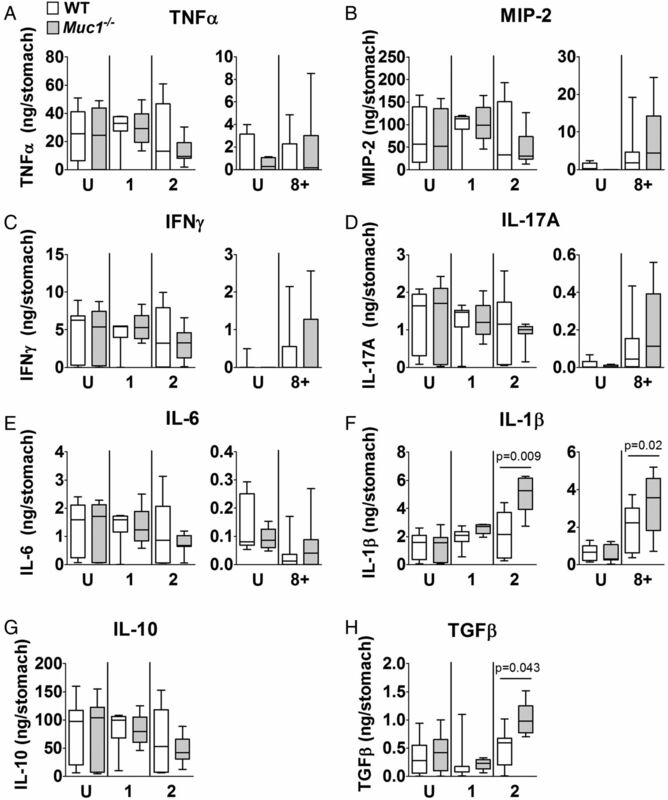 Notably, IL-1β was the only measured proinflammatory cytokine significantly elevated in H. pylori-infected Muc1−/− mice (figure 3F). IL-1β levels increased at 2 months post infection, coinciding with development of atrophic gastritis in these animals.14 Hence in wildtype mice, reduced IL-1β production paralleled reduced inflammation. We also assessed the immunoregulatory cytokines IL-10 and TGF-β. Although no difference was observed in IL-10, Muc1−/− mice had significantly elevated TGF-β after 2 months of infection (figure 3G, H), which likely represents an attempt to regulate inflammation in these animals. 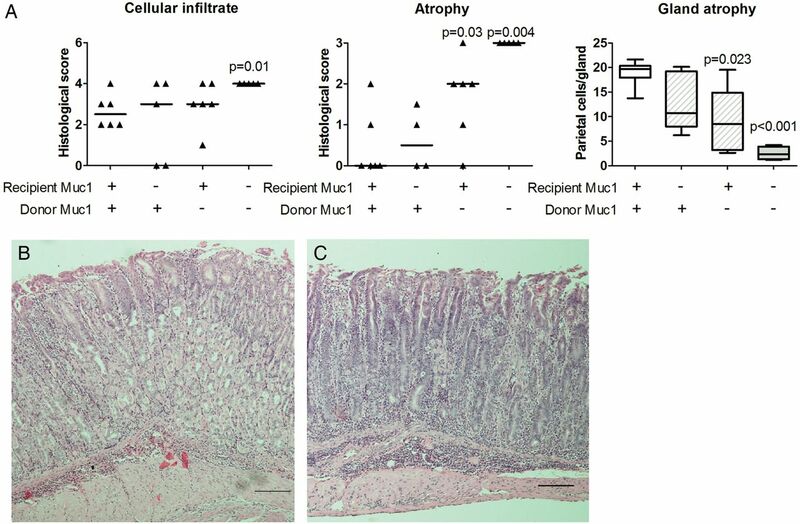 Increased pathology in Muc1−/− mice is associated with elevated gastric interleukin (IL)-1β. Wildtype (WT) and Muc1−/− mice were infected with a single dose of Helicobacter pylori SS1 for 1, 2 (n=5–12) or 8+ months (as in figure 1). (A–H) Cytokines in gastric homogenates were quantified by ELISA. Age-matched negative controls were left uninfected (U) and analysed simultaneously with the infected mice. (F) Muc1−/− stomachs had significantly elevated IL-1β compared with WT stomachs after 2 months and long-term infection (analysis of variance). Data for 1-month to 2-month infections were pooled from two separate experiments. Graphs present the median (horizontal bar), IQR (box) and 10th and 90th centiles (bars). MIP, macrophage inflammatory protein; TGF, transforming growth factor; TNF, tumour necrosis factor. Previous experiments revealed that stomach-specific overexpression of human IL-1β in mice leads to gastritis, dysplasia and cancer in the absence of H. pylori infection.30 We have reported previously that TFF2-deficient mice also display accelerated progression from gastritis to dysplasia after infection with H. pylori.31 TFF2, a member of the trefoil factor family of secreted peptides, has well-established roles in the maintenance of gastric epithelial homeostasis.22 ,32 Additionally, loss of TFF2 expression via methylation of promoter and first exon sites (as indicated in figure 4A) is a pivotal epigenetic event underlying gastric tumorigenesis in humans and mice.22 We hypothesised that elevated IL-1β expression alone is sufficient to induce Tff2 epigenetic silencing. Consistent with this, Tff2 mRNA levels were substantially reduced in stomachs of IL-1β transgenic (IL-1βTg) mice compared with wildtype littermate controls (figure 4B), while methylation was increased (figure 4C, D). Increased Tff2 promoter methylation in Helicobacter pylori-infected Muc1−/− mice and in H+K+ATPase/hIL-1β transgenic mice. (A) Tff2 methylation sites. (B) qRT-PCR analysis of Tff2 mRNA expression levels in stomach tissue from H+K+ATPase/hIL-1β transgenic (IL-1β Tg) mice and wildtype (WT) controls. IL-1β Tg mice expressed reduced Tff2 consistent with increased gene methylation (Mann–Whitney) (C and D) Quantitative Tff2 promoter methylation analysis in IL-1β Tg mice and WT controls. (C) Box plot showing CpG methylation levels expressed as the ratio of total methylated/unmethylated DNA at four CpG dinucleotides in the Tff2 promoter region. There was significantly increased Tff2 promoter methylation in IL-1β Tg mice compared with WT mice (analysis of variance (ANOVA)). (D) Heatmap showing two-way hierarchical cluster analysis of the data presented in (C), annotation as described above. IL-1β Tg samples are identified within the heatmap by black shading in the key to the right. (E and F) Quantitative Tff2 promoter methylation analysis in 8+ month H. pylori-infected WT and Muc1−/− mice together with age-matched uninfected controls (as in figure 1). (E) Box plot showing CpG methylation levels; infected Muc1−/− mice had significantly increased methylation compared with infected WT mice (ANOVA). (F) Heatmap showing two-way hierarchical cluster analysis of CpG methylation (columns) and stomach tissue samples (rows) of the data presented in (E). Differential methylation levels are colour coded; areas of low methylation (green), high methylation (red). H. pylori-infected Muc1−/− samples are identified within the heatmap by black shading in the key to the right. (G) qRT-PCR analysis of Tff2 mRNA levels in stomach tissue from 8+ month H. pylori-infected WT and Muc1−/− mice together with controls. Both infected WT and Muc1−/− mice had significantly reduced Tff2 levels compared with uninfected controls (ANOVA). Given this observation and that the phenotype of Muc1−/− mice infected long term with H. pylori bore a striking resemblance to that of Tff2−/− mice, we hypothesised that epigenetic silencing leading to loss of Tff2 expression could be an underlying mechanism for severe gastric pathology in H. pylori-infected Muc1−/− mice. At 2 months post infection, there was a non-significant increase in Tff2 methylation in Muc1−/− mice (data not shown). 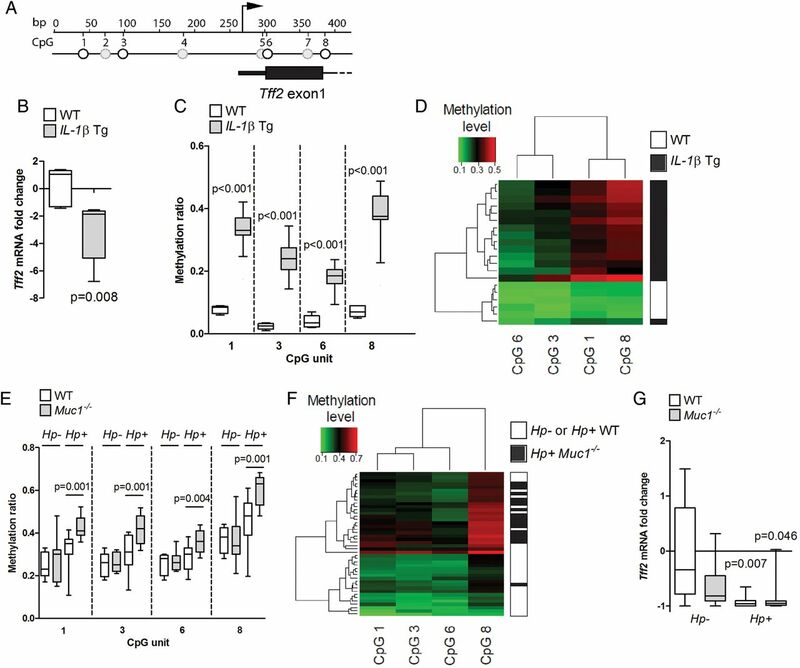 By contrast, analysis after long-term infection revealed elevated Tff2 methylation in H. pylori-infected mice, with infected Muc1−/− mice presenting significantly elevated Tff2 methylation compared with infected wildtype controls (figure 4E). Differences in Tff2 methylation after long-term infection allowed H. pylori-infected Muc1−/− mice to be broadly distinguished from uninfected and infected wildtype controls in two-way hierarchical clustering analysis (figure 4F). Therefore, aberrant Tff2 methylation was acquired in concert with the progression of gastric pathology in Muc1−/− mice. Both long-term-infected wildtype and Muc1−/− mice had clearly reduced expression of Tff2 mRNA (figure 4G), suggesting that even the intermediate Tff2 methylation observed in infected wildtype mice was capable of reducing Tff2 expression. These results are consistent with the hypothesis that IL-1β promotes pre-neoplastic progression in Muc1−/− mice, at least in part, by inducing methylation and silencing of Tff2. Radiation chimaeras were used to assess the relative contributions of MUC1-expressing haematopoietic and non-haematopoietic cells in regulating H. pylori-induced gastritis. Only mice lacking haematopoietic MUC1 developed significant atrophic gastritis, and this occurred regardless of their non-haematopoietic genotype (figure 5). Thus, it was MUC1 expressed on immune cells (and not epithelial cells) that regulated the severity of H. pylori-induced gastritis. Increased pathology in Muc1−/− mice is dependent on MUC1-deficient haematopoietic cells. (A) Recipient wildtype and Muc1−/− mice were irradiated and injected with bone marrow cells from either syngeneic or allogeneic donors. After 2 months reconstitution, chimaeric mice were infected with Helicobacter pylori SS1. Gastric inflammation was graded histologically and parietal cells quantitated (gland atrophy) 2 months post infection. Only mice receiving Muc1−/− bone marrow developed significant atrophic gastritis (p values cf wildtype syngeneic control; Mann–Whitney). Graphs present individual mice (points) and group medians (horizontal bar). Representative photomicrographs with typical pathology are shown of (B) an infected Muc1−/− mouse reconstituted with wildtype bone marrow and (C) an infected wildtype mouse reconstituted with Muc1−/− bone marrow (100 μM scale bars). Phenotyping the main types of immune cells present in the stomachs of infected mice by flow cytometry (gating strategy shown in figure 6A) revealed no differences in the absolute numbers of T cells, a trend towards increased monocyte/macrophages, B cells and neutrophils, and significantly increased numbers of dendritic cells (figure 6B). Further analysis of the monocyte/macrophage population revealed that specifically the P2 subset, which has elevated inflammatory activity,24 was significantly increased in the Muc1−/− mice (figure 6B). One population of cells we have previously shown were recruited by elevated IL-1b are myeloid-derived suppressor cells (MDSCs).30 To see whether there was preferential recruitment of these cells in Muc1−/− mice, we assessed CD11b+Ly6G/Ly6C+ cells and expression of S100a8/S100a9, proinflammatory chemokines that correlate with MDSC presence. While infection increased both types of myeloid cells and S100a8/S100a9 expression, there was no difference between wildtype and Muc1−/− mice (see online supplementary figure S2). Muc1−/− mice have increased gastric recruitment of specific cell types after infection. Wildtype (WT) and Muc1−/− mice (n=5) were infected with a single dose of Helicobacter pylori SS1 for 2 months or left uninfected. Cells were isolated from stomachs and analysed by flow cytometry. (A) Gating strategy used to identify particular immune cells. (B) Numbers of immune cell types in the gastric compartment. Infected Muc1−/− mice had significantly increased numbers of dendritic cells and P2 monocyte/macrophages compared with WT mice (analysis of variance). Graphs present the median (horizontal bar), IQR (box) and 10th and 90th centiles (bars). The association between elevated IL-1β and severe H. pylori gastritis indicated Muc1 may regulate inflammasome(s), multimeric proteolytic complexes responsible for processing inactive pro-IL-1β and pro-IL-18 into mature cytokines. Stimulation of both macrophages and dendritic cells, cells commonly used to examine inflammasome activation and IL-1β production, with either live H. pylori or bacterial lysate induced IL-1β secretion (figure 7A). Glyburide (an NLRP3 inflammasome inhibitor) significantly reduced the levels of IL-1β (figure 7A), demonstrating that IL-1β production was at least in part dependent on the NLRP3 inflammasome. 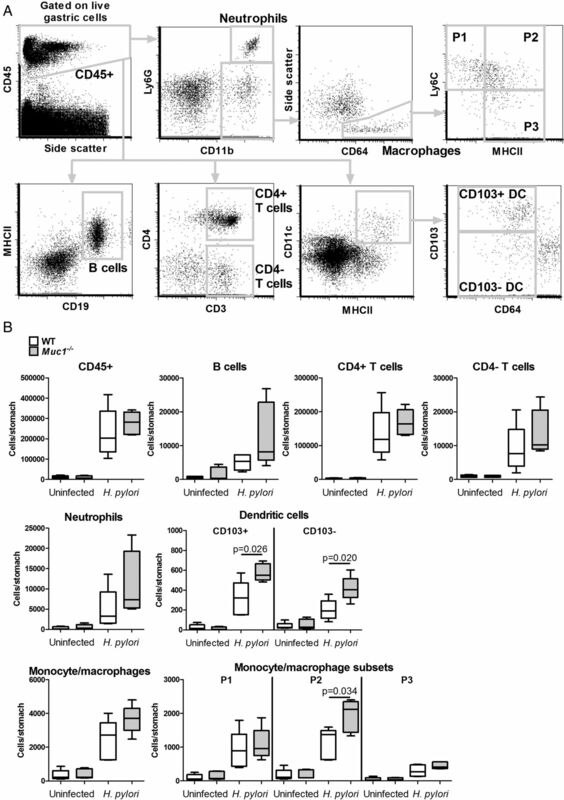 Assessment of Muc1−/− cells revealed macrophages but not dendritic cells, produced significantly increased IL-1β compared with wildtype cells in response to H. pylori lysate (figure 7B). Muc1−/− macrophages also produced significantly elevated levels of IL-18 (figure 7C). MUC1 regulates the inflammasome response to Helicobacter pylori infection. (A) Wildtype (WT) macrophages (n=7) and dendritic cells (n=8) were stimulated overnight with H. pylori lysate or live H. pylori with or without glyburide. Live H. pylori and to a lesser extent H. pylori lysate induced interleukin (IL)-1β production in a manner that could be inhibited by glyburide (*analysis of variance (ANOVA) cf media; #ANOVA cf H. pylori alone). (B) IL-1β levels in supernatants of WT and Muc1−/− macrophages or dendritic cells (n=6) cultured overnight with H. pylori lysate (ELISA). (C) IL-18 levels in supernatants from WT and Muc1−/− macrophages (ELISA). Muc1−/− cells secreted significantly more IL-1β and IL-18 (ANOVA). (D) Muc1−/− and Casp1−/− mice, interbred to produce F3 Muc1−/−Casp1−/− mice and matched controls, were infected with H. pylori SS1 (n=11 WT, n=8 Muc1−/− and n=6 Muc1−/−Casp1−/−). Age-matched littermates were left uninfected as controls (n=6 WT, n=7 Muc1−/− and n=2 Muc1−/−Casp1−/−). Gastric inflammation was assessed histologically 2 months post infection. Muc1−/− mice but not Muc1−/−Casp1−/− mice developed a significant atrophic gastritis (p values cf-infected WT; Mann–Whitney). Graphs present individual mice (points) and group medians (horizontal bar). (E) Representative photomicrographs showing typical pathology from infected Muc1−/− and Muc1−/−Casp1−/− mice (100 μM scale bars). As caspase-1 is the main effector protease responsible for inflammasome activity, we generated mice deficient in both Muc1 and Casp1. When infected with H. pylori, Muc1−/− but not matched Muc1−/−Casp1−/− mice developed significant atrophic gastritis (figure 7D, E), indicating that severe pathology in infected Muc1−/− mice was the result of increased inflammasome activation. While several distinct inflammasome complexes exist, H. pylori has been previously shown capable of activating the NLRP3 inflammasome.33 ,34 We found that Nlrp3 expression was significantly increased in the stomachs of Muc1−/− but not wildtype mice infected with H. pylori for 2 months (figure 8A). Further, western blotting showed that Muc1−/− macrophages had significantly increased NLRP3 protein levels compared with wildtype cells after 3 h of LPS or H. pylori lysate stimulation (figure 8B), indicating MUC1 regulates NLRP3 expression following Toll-like receptor (TLR) activation. MUC1 regulation of NLRP3 expression and nuclear factor (NF)-κB pathway activation via inhibition of IRAK4 phosphorylation. (A) Stomachs from Muc1−/− mice infected with Helicobacter pylori for 2 months (n=6) had elevated Nlrp3 expression (by qRT-PCR) relative to infected wildtype (WT) stomachs (analysis of variance (ANOVA)). (B) NLRP3 protein induction in lipopolysaccharide (LPS) or H. pylori lysate stimulated macrophages was examined by western blot. A representative blot (two independent experiments for LPS) is shown with densitometry values after 3 h stimulation (n=4 for LPS; n=3 for H. pylori lysate). Muc1−/− macrophages expressed significantly higher levels of NLRP3 3 h after stimulation (ANOVA). (C) Relative mRNA expression of Nlrp3 in macrophages pulsed with BAY 11-7082 for 45 min prior to stimulation with LPS or H. pylori lysate (n=5). Muc1−/− cells had significantly higher levels of Nlrp3 expression compared to WT cells after 3 h stimulation (ANOVA). BAY 11-7082 inhibited upregulation of Nlrp3. Graphs present the median (horizontal bar), IQR (box) and 10th and 90th centiles (bars). (D and E) Activation of nuclear factor (NF)-κB following stimulation with LPS or H. pylori lysate was assessed by western blotting of phosphorylated and total forms of p65 and IKKs. Representative blots are shown with densitometry values from 6 (LPS) or 5 (H. pylori lysate) separate experiments (mean and SEM). Stimulated Muc1−/− cells had increased phosphorylation of both p65 and IKKα/β compared with WT cells (ANOVA). (F and G) Activation of IRAK4 was assessed by western blotting of phosphorylated and total forms. Representative blots are shown with densitometry values from 3 (LPS) and 6 (H. pylori lysate) separate experiments (mean and SEM). Muc1−/− cells had increased phosphorylation of IRAK4 compared with WT cells following stimulation with either (F) LPS or (G) H. pylori (ANOVA). (H) Relative Nlrp3 expression in macrophages pulsed with IRAK1/4 inhibitor I for 30 min prior to H. pylori lysate stimulation for 3 h (n=5). IRAK1/4 inhibitor I inhibited upregulation of Nlrp3. Graph presents the median (horizontal bar), IQR (box) and 10th and 90th centiles (bars). As human MUC1 is known to regulate the NF-κB pathway,35–37 and activation of this pathway can regulate NLRP3 expression,38 we hypothesised that MUC1 may inhibit NLRP3 inflammasome activation by negative regulation of TLR signalling. Treatment with the IKK inhibitor BAY 11-7082, prior to LPS or H. pylori lysate stimulation, completely inhibited Nlrp3 upregulation in both wildtype and Muc1−/− macrophages (figure 8C), indicating that the increased Nlrp3 expression was indeed dependent on activation of NF-κB and not other transcription factors activated by TLRs, including AP-1.39 We also assessed (i) miR-223 levels, as this regulates Nlrp3 expression,40 and (ii) the ATP-synthesising capacity of macrophages as an indirect measure of mitochondrial membrane perturbation, which is intimately linked with NLRP3 activation,41 but found no effect of MUC1 on either measure (see online supplementary figures S3 and S4). We next examined several key intermediates along the TLR/NF-κB pathways to determine where murine MUC1 regulated NF-κB activation. Western blotting revealed that phosphorylation and activation of p65 was accentuated in Muc1−/− macrophages after LPS or H. pylori lysate treatment (figure 8D, E). An interaction between human MUC1 oncoprotein and IKKs, the initial kinases of the NF-κB pathway upstream of p65, has previously been suggested,42 and we noted that Muc1−/− cells displayed increased IKKα/β activity after LPS stimulation (figure 8D). We finally examined activation of IRAK4, the first kinase activated in the TLR pathway. Importantly, we found significantly increased activation of IRAK4 in Muc1−/− macrophages following stimulation with either LPS (figure 8F) or H. pylori lysate (figure 8G). We confirmed that Nlrp3 upregulation in response to H. pylori lysate was indeed dependent on IRAK4 activation by treatment with IRAK1/4 inhibitor, which abrogated upregulation of Nlrp3 (figure 8H). This indicates that Muc1 regulates NF-κB activation by suppressing the initial steps of TLR activation. 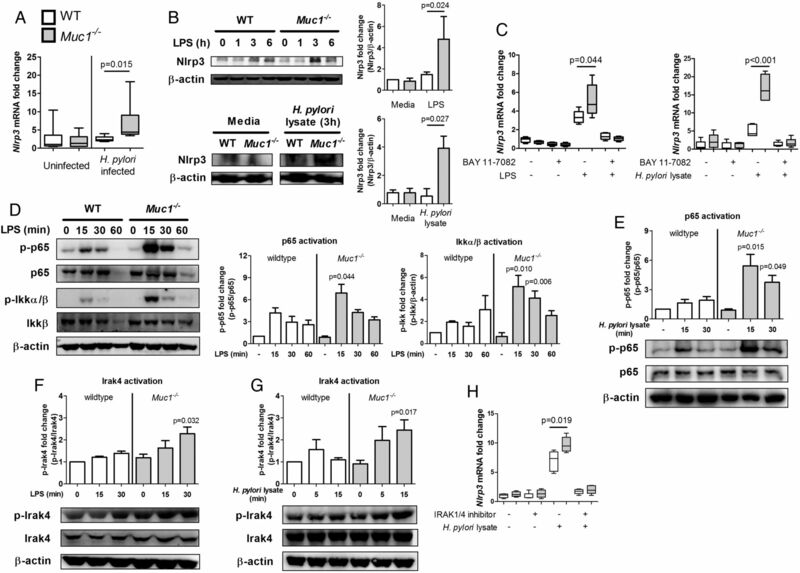 The increased NLRP3 inflammasome activity in Muc1−/− cells therefore results from increased expression of NLRP3 due to a loss of regulation of the TLR/NF-κB pathways at or above the level of IRAK4. To examine the role of the NLRP3 inflammasome in the severe gastritis observed in H. pylori-infected Muc1−/−mice, we generated mice deficient in both Muc1−/−and Nlrp3−/−. Muc1−/− but not Muc1−/−Nlrp3−/− macrophages produced significantly more IL-1β in response to H. pylori lysate (figure 9A). Infected Muc1−/−, but not Muc1−/−Nlrp3−/−, mice had a significant increase in gastric IL-1β and IL-18 levels (figure 9B). In addition, only infected Muc1−/− mice developed a significant atrophic gastritis (figure 9C,D). This demonstrates that the severe H. pylori-induced gastritis and elevated IL-1β levels observed in Muc1−/−mice resulted from a loss of regulation of the NLRP3 inflammasome that is activated by H. pylori infection. Atrophic gastritis in Muc1−/− mice is NLRP3 dependent. Muc1−/− and Nlrp3−/− mice were interbred to produce F3 Muc1−/−Nlrp3−/− mice and age-matched littermate controls. Mice were infected with Helicobacter pylori SS1 for 2 months or left uninfected. (A) Macrophages from uninfected mice (n=6) were stimulated overnight with H. pylori lysate and interleukin (IL)-1β levels measured by ELISA. Muc1−/− but not Muc1−/−Nlrp3−/− macrophages produced increased IL-1β compared to wildtype (WT) macrophages. (B) Infected Muc1−/− but not Muc1−/−Nlrp3−/− mice (n=7) had significantly elevated gastric IL-1β and IL-18 (ELISA; analysis of variance). (C) Gastric inflammation was assessed histologically. Infected Muc1−/− but not Muc1−/−Nlrp3−/− mice developed a significant atrophic gastritis (p values cf-infected WT; Mann–Whitney). Graphs present individual mice (points) and group medians (horizontal bar). (D) Representative photomicrographs showing typical pathology from infected Muc1−/− and Muc1−/−Nlrp3−/− mice (100 μM scale bars). Excessive or misdirected inflammation is a central aspect of many GI diseases, and thus regulatory mechanisms that limit immune overactivation are of great importance. The NLRP3 inflammasome is activated by a large array of ligands and therefore the potential for harmful non-specific activation is much greater than for other innate receptors. 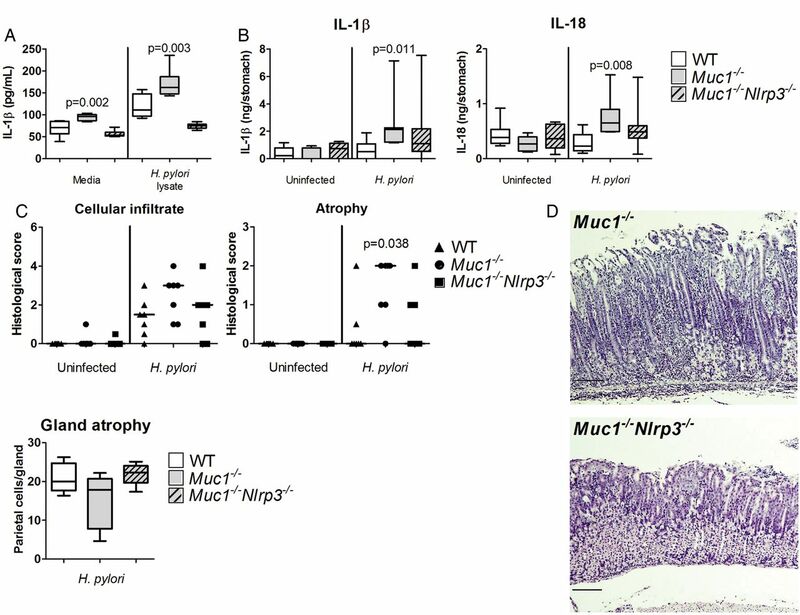 Here we show that the cell-associated mucin MUC1 plays a key role in negatively regulating NLRP3 inflammasome activity on immune cells, ultimately restraining the inflammation induced by chronic H. pylori infection. Further, we demonstrate that this occurs via the ability of MUC1 to regulate NLRP3 expression via suppression of TLR/NF-κB pathway activation. Profound effects on mortality, dysplasia and epigenetic changes demonstrate the functional importance of MUC1 regulation of NLRP3 inflammasome activation. MUC1 was first linked with increased susceptibility to H. pylori-related pathologies more than a decade ago,11 ,12 although the mechanism behind this observation remains unclear. Consistent with the prevailing understanding of the role of MUC1, we previously proposed that elevated gastritis in Muc1−/− mice could be due to the ability of MUC1 to limit pathogen contact with the host epithelium.14 ,15 However, our latest findings surprisingly indicate that leucocyte MUC1 directly regulates the host immune system to limit activation of the NLRP3 inflammasome. Regarding H. pylori, both TLR2 and NOD2 activation induce expression of NLRP3, which then acts as the primary inflammasome activator to bacterial virulence factors including the cag pathogenicity island (cagPAI) and VacA.33 ,34 In our experiments, the SS1 strain, which possesses a dysfunctional cagPAI,43 was used, indicating that cagPAI-independent NLRP3 activation must also occur. Here we show that increased NLRP3 expression occurs in the absence of MUC1, in conjunction with increased phosphorylation of IRAK4, IKKs and p65, indicating MUC1 limits NLRP3 activation by suppression of TLR/NF-κB-dependent priming. Our demonstration here of the regulatory role of MUC1 is, to our knowledge, the first to clearly establish the importance of NF-κB regulation in preventing excessive NLRP3 inflammasome activation, as evidenced by the severe pathology and mortality observed in infected Muc1−/− mice. In support of our findings, previous studies have shown that MUC1 negatively regulates TLR signalling and subsequent NF-κB activation,35–37 although the precise mechanism for this effect was not identified. We now demonstrate for the first time that MUC1 negatively regulates phosphorylation of IRAK4. During TLR activation, IRAK4 is recruited to the cell membrane where it binds to TLR cytoplasmic domains via MyD88, well upstream of IKK activation.44 This demonstrates that MUC1 influences TLR/NF-κB signalling at a much earlier point than shown previously, potentially via direct interactions with TLRs, MyD88 or IRAK4, which all localise at the cell membrane during TLR activation. MUC1 has previously been demonstrated to directly associate with TLR5 and inhibit MyD88 binding,45 thus further supporting a role for MUC1 in regulating the initial stages of TLR activation. Another surprising finding was the lack of increase in proinflammatory cytokines assessed other than IL-1β within the inflamed gastric mucosa of infected Muc1−/− or 129/SvJ mice. We believe the specific cytokine profile is due to the 129/SvJ genetic background, which could have aided our investigation into the modulation of IL-1β by MUC1. A key difference between 129 strains, such as the 129/SvJs used in our studies, from mice used in other studies is defective caspase-11.17 Another contributing factor may have been MDSCs, which are well known to have potent immunosuppressive ability and are recruited following elevated gastric IL-1β.30 However, our data suggest MDSCs were recruited into the H. pylori-infected stomachs of both wildtype and Muc1−/− 129/Sv mice, even though only the Muc1−/− mice had elevated gastric IL-1β. As such cells could suppress secretion of other cytokines, this recruitment may explain the unusually specific cytokine profile observed after infection in 129/Sv mice, although the mechanism of MDSC recruitment does not appear to involve IL-1β. Recent studies in mice have demonstrated that during Helicobacter infection IL-1β promotes atrophic gastritis and neoplasia while IL-18 limits gastritis through promoting regulatory T cell development,30 ,46 ,47 demonstrating that inflammasome activation in the host can contribute both pro-inflammatory and anti-inflammatory activity. Overall, NLRP3 inflammasome activity is proinflammatory in vivo, with Nlrp3−/− mice displaying reduced gastritis after infection.34 An important observation that emerges with the use of Muc1−/− mice is that H. pylori is a potent activator of the NLRP3 inflammasome, but under normal circumstances this is not overtly apparent, due to host regulation of this process. This is consistent with the only minor reduction in gastritis observed after H. pylori infection of Asc−/− mice, which should lack all inflammasome activity.48 Full activation of the NLRP3 inflammasome probably only develops when regulation is lost, for example, in the absence of MUC1. Under those conditions, the consequences are clearly severe as H. pylori, normally a fairly benign coloniser of conventional mice, became a lethal infection with the development of gastric dysplasia. Although a causative role of aberrant inflammation on tumorigenesis is now accepted, exactly how innate inflammatory molecules such as IL-1β drive gastric tumorigenesis remains unclear. We have previously demonstrated the causative role of (i) elevated IL-1β and (ii) silencing of Tff2 individually in gastric tumorigenesis.22 ,30 ,31 In this study, we demonstrate a potential link between these factors showing that gastric IL-1β overexpression in both transgenic mice and in H. pylori-infected Muc1−/− mice is associated with Tff2 methylation. IL-1β has previously been described to promote the activity of DNA methyltransferase-1 via nitric oxide production, resulting in aberrant methylation of FMR1 and HPRT.49 While only Tff2 has been studied, it is possible that a spectrum of other genes, including tumour suppressor genes, are similarly affected. Regardless of Tff2, this provides a framework to explain how inflammatory molecules (and modulators such as MUC1) may promote tumorigenesis, and potentially provides a clinical approach via the targeting of IL-1β or the NLRP3 inflammasome. In summary, we have demonstrated that MUC1 on immune cells is a novel regulator of the NLRP3 inflammasome, and propose this is mediated by an interaction with signalling components at the cytoplasmic domains of TLRs that involves inhibition of IRAK4 activation. In the absence of appropriate regulation, the NLRP3 inflammasome is a key driver of H. pylori-induced pathologies via the promotion of gastric IL-1β production, which we propose leads to epigenetic silencing of tumour suppressor gene expression and is associated with the development of gastric dysplasia. Hence while mucins are currently best recognised for key roles at epithelial surfaces, MUC1 clearly also plays a fundamentally important and previously unidentified role in regulating the response of immune cells to certain inflammatory stimuli. The authors thank Ben Croker for providing Casp1−/− and Nlrp3−/− mice.
. Expression of MUC-1 epitopes on normal bone marrow: implications for the detection of micrometastatic tumor cells. J Clin Oncol 1999;17:1535–44.
. Expression of MUC1 mucin on activated human T cells: implications for a role of MUC1 in normal immune regulation. Cancer Res 1998;58:4079–81.
. MUC1 epithelial mucin (CD227) is expressed by activated dendritic cells. J Leukoc Biol 2002;72:692–701. International Agency for Research on Cancer. GLOBOCON 2012: estimated cancer incidence, mortality and prevalence worldwide in 2012. World Health Organization, 2012. Contributors PS and MAM obtained funding. GZN, TRM, ALE, ASG, MAM and PS designed and analysed experiments. GZN, TRM, ALE, AS, YTC, PD and JCK performed the experiments. GZN and LMJ performed histological analyses. TCW provided IL-1Tg mice. GZN, TRM and PS prepared the manuscript. All authors revised and approved the final manuscript. Funding This work was supported by the Victorian Government's Operational Infrastructure Support Program and by Project Grant #1046254 from the National Health and Medical Research Council (NHMRC) of Australia. PS and MAM are supported by Senior Research Fellowships from the NHMRC and GZN was partly supported by a Melbourne Research Scholarship from the University of Melbourne. Ethics approval All experiments were performed on age-matched female mice under the University of Melbourne Animal Ethics Committee approval.